These are two great photographs. Let's hope that there are more safely nestling in the albums of your other family members. The census returns are mines of information aren't they? Even with ten years in between, we can still get a pretty clear picture of the movements and fortunes of our ancestors. That second picture is so memorable - you could look into those young faces for ages and imagine what the years to come would bring for them. Wonderful post - classic Sepia Saturday. I Love The way the Girls Pose!.I always think you can tell something of the personality of a photographer by the subtle reaction&expression of his subjects.Stephen looks to be a jolly & humourous fellow...they look so relaxed. 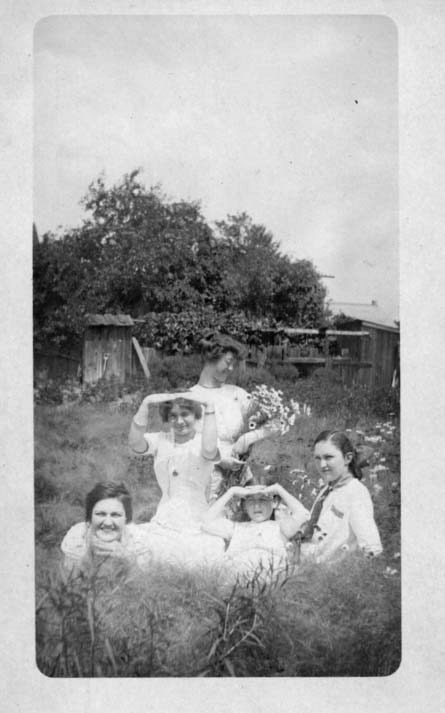 Your grandpap's photo of the McCarthy girls is quite remarkable. They are obviously at ease with him and their playfulness shines through. They were obviously enjoying their experience. So, Kimy; you must have inherited your shutterbugging talent from him. Yes? We can only hope for such a "good death". This was fabulous! What a handsome man your grandpa was...and a talented photographer. The girls in the next photo just make me smile! Loved that he had an optimistic attitude and lived a long life...wonderful! Absolutely fascinating. I especially enjoyed your analysis of the census data. A real piece of primary source investigation! The pairing of the song and the photos was lovely. Thanks for mentioning Grit newspaper! Apparently it's still around. My grandmother subscribed to it and Capper's Weekly, which was very similar. She would turn her nose up to the New York Times, Time and all other periodicals and saw these has her window on the world. I'm not sure that they had a particular political bent, but they were huge among rural populations well into the late 1970s. I can get lost in census (and other types of data) for hours, days, weeks - geez actually months and years if I consider various research projects! alan - i'll have to ask my dad next time i talk to him and see if he remembers what happened with all the mccarthy girls - of course they were all grown women when he came into the world, but lofty was (and still is) a very close knit community....although today it's a pretty tiny community! subby - i wonder if any of the cousins have grandpap's camera - who knows it may still be somewhere in the house! will have to ask uncle george. my father wasn't too much into movies, but he was trained as a photographer for the navy ....which actually will be a good subject for an upcoming sepia saturday! I have some good documents that pertain to that - although I'll have make sure they don't breach national security! tony - grandpap had a wickedly fine sense of humor!! he was absolutely the best!! you might be able to tell, i adored him....still do! barry - and the girl gazing at the daisies - how sweet is that! kat - and my dad!! see comment to subby - my dad gave me my first camera when i was 8.... it's a bond we still share, although sadly his days of taking photos are over, but he still loves to look at photos and now a days loves to be my subject! which is a fair turn about seeing that all the family were his subjects while we were growing up! willow - i wonder where the photographic gene falls in terms of the dna sequencing! betsy - grandpap taught us that optimism & pessimism was contagious and he believed best to be optimistic! leah - i have so much fun matching a song to a post! glad you liked the pairing today! junk - ah, maybe that's why i like you so much you remind me of grandpap! Beginning with the September 2006 issue, Grit converted to an all-glossy, perfect bound magazine format and a bi-monthly schedule. The revamped editorial policy encompasses more of a contemporary rural emphasis on content, rather than the nostalgic themes of the previous decade. With a print run of 150,000 and Time Warner as the national newsstand distributor, Grit is now displayed and sold at general newsstand outlets, bookstores and specialty farm feed and supply stores, including Tractor Supply. yikes!!! will have to check it out next time i'm in a tractor supply! maybe lehman's in kidron, ohio carries it - that place is even better than tractor supply. The photo of the young women is remarkable for its good spiritedness, & there is a gentle bearing in your grandpa's portrait that meshes with your description of him. Great census detective work, & apparently seamless photo restoration! interesting bit of history and the photos to make it real. 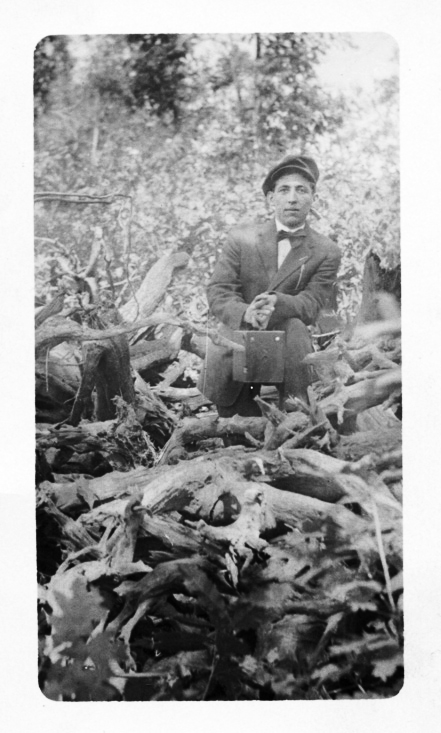 my father was born in 1910. he probably knew who Chauncey was. he certainly knew that song tho' we're not Irish. The second picture certainly shows a bevy of beauties. Wonder who the fifth girl is -- a cousin, a neighbor? Your grandfather sounds like an interesting and charming man. john - love census data - of course my academic background would predict that - ha ha!! meri - i'll have to check out the census data and see if i can figue out who the 5th girl is....sounds like a movie - ha ha! he sounds like a wonderful character and a lovely grandfather. and the maCarthay photo - that could be the basis for a short story couldn't it? Very interesting to see Grandpa a young photo maniac. The box camera is wonderful. The second picture is great. Almost a magical scene in the way it was taken.